What Is It like to Spend All Day in Bethlehem? And Then Meet the Bishop of Jerusalem? Today we call the Bethlehem day. We get up in the morning and head through the big separation wall into the concentration camp called Bethlehem. It’s not like a concentration camp and Nazi times, but it is very abusive and unfair to the Christians who are stuck behind that wall unable to leave their 7 square miles of confinement. But it is always wonderful to visit the city where our Lord was born in to see the place, the exact place, where he entered the world. We also have Mass at the place with the Angels split this skies and came down singing and rejoicing about the birth of Jesus Christ. DON’T FORGET TO LEAVE A COMMENT BELOW FOR THE PILGRIMS. I WILL READ THE COMMENTS ON THE BUS. It’s also nice to get all your Christmas shopping done in May :-) We take everyone to our favorite shop in Bethlehem where we support 65 Christian families with our purchases and everyone goes home with quality Olivewood product’s and other gifts. Then we had back through the wall into Jerusalem – and before we go to bed we stopped at that patriarchate of Jerusalem and have a special meeting with the Bishop of Jerusalem who shares with us information about the Christian situation in the Holy Land and gives us his apostolic blessing. Remember in Genesis 18 when the three angels came to visit Abraham? We are told in the first verse that it was the Lord that came to visit him. Christian tradition has seen these three messengers as being the Trinity coming down to visit Abraham and to judge Sodom and Gomorrah. That took place 4000 years ago. Where is that place? It is relatively unknown. Most of the locals did not even know what we were looking for. Because no one knew where it was. 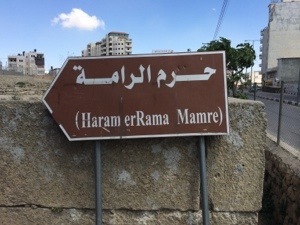 But we finally located it in a plot of land with a fence around it just north of Hebron. Because it was Friday, the holy day for Muslims, it was closed. But I was able to climb over the fence and get inside to take some pictures. It was VERY exciting to find this ancient site. 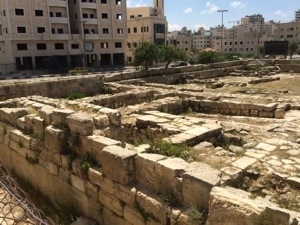 There are ruins of an enclosing wall built by King Herod 2000 years ago and also the ruins and remains of a church built by Constantine in the 4th century commemorating the place where Abraham pitched his tent. We will be back in June to film here for our upcoming movie “Abraham, Father of Faith & Works.” You will get the whole story when the documentary is released for Christmas this year.